Consider whether you have ever had the following experience. After working up a good sweat in an energetic class, you take off you uniform, change into your street clothes, and put your belt, hakama, and gi into your uniform bag. As you prepare to leave, you reach down to pick up your equipment bag, and whoof, it feels like it weighs a hundred pounds! How the heck did that uniform suddenly get so heavy? Cripes! Did somebody slip some bricks in here? This experience is what Saotome Sensei calls the “principle of clothing” or the “principle of the dogi”. While you were wearing that uniform – even when it was heavy with sweat, you didn’t notice the weight because it was distributed over your body, connected to your center, almost part of your skin. But when you took it off and made it no longer a part of you, its true weight and resistance to your strength was revealed. This “principle of the dogi” has interesting physical and spiritual/mental implications for our training. The physical aspect to the principle is very straightforward. Our physical power is concentrated at our physical center (our “hara”), and the further we extend away from our center the more of our strength we might surrender. If we make a linear motion (such as pushing or pulling directly from our center of balance), we can connect that motion to our “center” strength; that’s why punches can be so strong. However, if we try to use any lateral force (imagine pushing down, or lifting up something at arm’s length) our strength is diminished, and the law of levers works against us. When dealing with an aggressor, this effect is multiplied since we are extending outside of our center of strength, and reaching in to their center of strength. So, any technique we try to do to our opponent has an inherent disadvantage – we must overcome uke’s strength where they are strongest. Of course, there are many Aikido concepts we can apply to negate that strength – kuzushi (offbalancing), atemi, de-ai / sen-sen-no-sen (timing principles), etc. But the principle of the dogi demonstrates that if we can maintain our own center and draw our opponent into it, they must leave their strength behind and interact with us where we are strongest. At its simplest expression, this principle teaches us that Aikido technique can be effortless, regardless of how much stronger or bigger our opponent is – if we make the point of connection at our center, or we load uke’s weight onto us so that we “wear them like a dogi”. 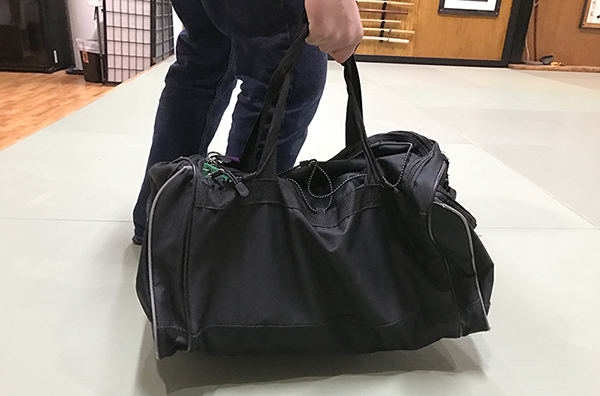 Anyone who has trained for very long has felt the difference between a koshi nage (hip throw) that was loaded improperly, and a koshi where uke was properly loaded onto one’s koshita (the back-board on the back of your hakama). One is full of strain and struggle, and the other is effortless. The spiritual / mental aspect to the principle is much more difficult. It touches on concepts of intent, security, and strength; to be emotionally centered you must not act out of fear, desire to harm, or even desire to perform. You must have faith that uke cannot harm you, and have enough strength and experience to know it in your bones. If we can manifest those things, we can make the attacker part of us and then simply change ourselves. Aiki is then not about technique (changing another), but rather about changing ourselves. As long as we have some fear that an opponent can hurt us, we have a seed of fear in our center. This drives us to keep our attacker at a distance, to be defensive on some level. If you are a parent and your small child is attacking you in a tantrum, you aren’t motivated to fend them off or to strike back; you have the perspective, strength, and self-belief to hug them instead. Imagine if you were strong enough to do that with any adult attacker! Unfortunately, there are many aspects of ego that draw us out of being emotionally centered – impatience, insecurity, fatigue, the desire to impress. Nothing ends a great randori or technique that is going well than the desire to execute a big throw for the audience. As soon as our focus and intent changes from maintaining an internal quality, composure, and strength of being to doing something to uke, we have extended away from our strength and entered into our uke’s strength. We’re human, and that means cultivating a powerful spiritual centeredness will be a constant exercise of centering, being distracted, and refocusing. Fortunately, our dojo affords us endless opportunities to practice mindfulness, endless opportunities to examine our emotional reactions, triggers, and changes of intent, and endless opportunities to get better at strengthening our emotional equanimity. “Do not stare into the eyes of your opponent: he may mesmerize you. Do not fix your gaze on his sword: he may intimidate you. Do not focus on your opponent at all: he may absorb your energy. The essence of training is to bring your opponent completely into your sphere. Then you can stand where you like. The principle of the dogi is a very concrete expression of aiki, as it is a manifestation the unification of energies between uke and nage. Of course, aiki is both physical and spiritual at the same time, and our art is based upon learning to deal with aggression from others with compassion and acceptance. By accepting uke’s attack without fear, we can tap into our greatest strength. Drawn from Saotome Sensei’s instruction during ASU Instructors Camp (2015, Shobukan Dojo / Washington D.C.), a workshop at the Aikido Chuseikan Dojo (June 2014), and private interviews with Saotome Sensei at the Aiki Corral (2014). Thank you for sharing, some wonderful concepts to think about! Today, at a class Sensei was teaching, he relayed a similar metaphor – it’s like the difference between catching a dropped 100-pound package against your stomach, or catching it at arm’s length. As nage, you want to catch it next you your center, or to “drop your weight” on uke away from theirs! This article has been translated into Turkish at the Empty Mirror Blog (http://www.bosayna.com/saotome-senseinin-dogi-prensibi/), by Oğuzhan Yılmaz. We witnessed an excellent translation into Turkish. Thanks to Guy Sensei for the original writing and its very successful translation into Turkish. Supposedly, Turks, being a Central Asian race at their roots, and having had close encounters with ancient Chinese martial arts, must carry their own genetic heritage as to the art of fighting. Today, this supposed heritage is long gone. Yet, such very thoughtful writings help us to perhaps remember part of that long gone heritage. In retrospect, I took my lessons and discover many of my weak points, such as my urge to throw my uke 3 to 4 floor mats to prove myself !